VATICAN CITY (CNS) — He’s on Twitter and all over Facebook; a U.S. producer is shooting a documentary about his life, and a renowned British actor is writing a play about him. 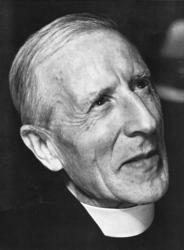 And yet still not many people know who Jesuit Father Pierre Teilhard de Chardin is. Many of his fans — be they scholars, scientists, artists — are trying to change all that and put this late paleontologist-priest back in the spotlight and in good standing with the Vatican. Born May 1, 1881, the French Jesuit was a distinguished geologist and paleontologist who took part in the 1925 discovery of the Peking Man, which supported a theory about human beings evolving over multiple regional lineages. The advisory never specified what the errors or ambiguities were and — as one theory goes — it ultimately could have been just a “political” maneuver meant to weaken the huge influence Father Teilhard’s ideas and perspectives were having on discussions at the Second Vatican Council, which began in 1962. Before Father Teilhard, the church had been looking at “how to defend God, the creator, against evolution, and now here was a Jesuit who saw evolution in God’s plan,” said Msgr. Melchor Sanchez de Toca, undersecretary of the Pontifical Council for Culture, and an expert in the relationship between science and faith. The Jesuit’s approach was groundbreaking because “it was not a simple reconciliation of science and faith; it was integrating, creating a single, wholistic vision because the past danger was having a radical separation” of the two, he told Catholic News Service in May. Today the “monitum,” Msgr. Sanchez said, “is completely obsolete” because not only did it never prevent people from studying his writings, but theologians today “can better make a global judgment about his works” and point to their intended meanings and specific weaknesses. Nonetheless, Father Teilhard’s overall vision greatly influenced the council fathers in their document, “Gaudium et Spes,” and every recent pope, starting with Blessed Paul VI, has favorably cited from the priest’s works. Pope Francis even gave him a footnote in his encyclical, “Laudato Si’,” incorporating his sense of a mysterious, beautiful unfolding of the world where the ultimate destiny of the universe is in the fullness of God. Msgr. Sanchez confirmed that Cardinal Gianfranco Ravasi, head of the culture council, submitted a proposal to Pope Francis to lift the “monitum” after the idea was brought up during the council’s plenary assembly in November 2017. Even though a formal statement lifting the warning would be a purely “symbolic” act at this point, it would still mean a lot to the priest’s relatives and the many associations that promote the study of his work, said David Grumett, an expert on Father Teilhard and senior lecturer in theology and ethics at the University of Edinburgh. Grumett told CNS that he hopes the unexpected, historical find earlier this year by Paul Bentley, a British actor best known for his role in HBO’s “Game of Thrones,” will encourage lifting the warning and, in turn, bring greater attention to what Father Teilhard can teach people today. Bentley, who has written a play about the Vatican-led investigation of the priest and the six propositions he was asked to sign, found the original propositions in the Rome archives of the Jesuit Curia. He also found never-before published correspondence between the Jesuit and his superiors, giving a fuller understanding of his thinking. Grumett and Bentley have co-authored a paper detailing the discoveries; it will be published in the June issue of Zygon: Journal of Religion and Science. However, Grumett said, “we need to communicate this not just with academic journals” and within universities, but through popular culture, like with Bentley’s hoped-for theater production, “to help people realize his message has relevance” to the wider world, not just scholars and Christians. “Teilhard was a paleontologist, working with fossils, and he had lots of evidence for biological evolution which saw the first human being originating from several lines of descendants” and not one couple, Grumett said. “He also saw original sin as being part of everything that exists,” noticing how things eventually decay or degrade, he said. Father Teilhard envisioned paradise, understood as a sinless, perfect place, as existing in the future, “not as a past historical place” from which man fell. There are problems with bringing traditional theology and science together, Grumett said, as evolution does affect “how we understand Adam and Eve, and paradise.” Even so, the six propositions and Father Teilhard’s subsequent actions show that he always remained obedient to the church, even though he found this difficult. Jesuit Father Paul Mueller, religious superior of the Jesuit community at the Vatican Observatory and expert in religion-science, told CNS questions touching upon science and faith should never be framed as “either-or” as if people should be forced to choose to be “loyal” to just one side. “Loyalty is ultimately to the truth — and both science and the church are in pursuit of the truth,” he wrote in an email response to questions. Human understanding or interpretation of both sources — the “book” of nature and the Book of Genesis — “is limited and imperfect,” Father Mueller said. “Both ‘books’ are written by the same ‘author,’ who is God — in the end they cannot disagree, since truth cannot contradict truth and God does not contradict God,” he added. “It is people who do not have faith in the ultimate unity of truth who end up forcing the likes of Galileo and Teilhard to sign (something) and who end up insisting that science proves there is no God,” Father Mueller said.